Our holiday apartment is located next to a romantic pond at the outskirts of the village of Utzstetten, an urban district of Täferrot, nearby the oldest Staufer City Schwäbisch Gmünd, a fascinating old town with magnificent patrician residences and preserved city towers. Due to its idyllic environment it offers abundant options of outdoor leisure and recreational activities – right in front of the door: jogging, cycling, in-line skating, hiking, horseback riding and many other possibilities. And it takes only a few minutes to get to the next gym in the neighbouring village. ...recreation for body and soul! 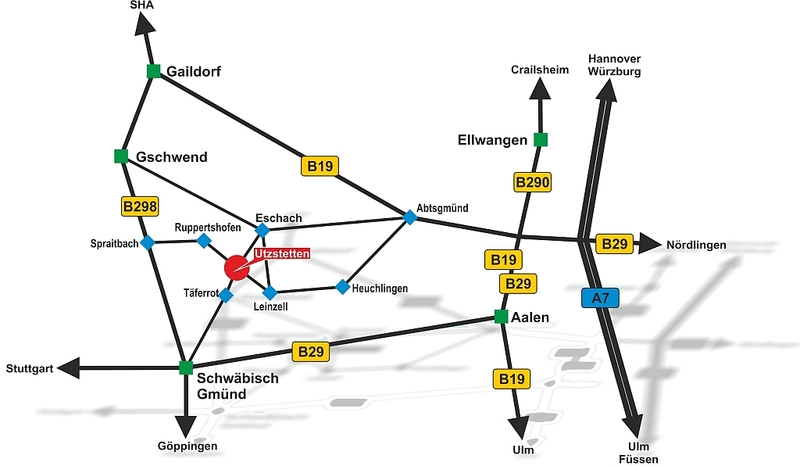 The cities of Aalen and Schwäbisch Gmünd are reachable in short time, as well as the regional capital of Stuttgart, about 60 km from Utzstetten.